Just a few hours after a ceremonial ribbon cutting for the new “adventure cabins” at Chattahoochee Bend State Park Friday, the first cabin guests arrived. The three cabins are booked every weekend through July 4, and there are several reservations for weekdays as well, according to Erin Kenner, park manager. “We’re thrilled about that,” Kenner said. The three cabins are the first phase of proposed cabin development at the state park, located along the Chattahoochee River in northwestern Coweta County. There is infrastructure in place for a total of 10 cabins. The three cabins are all two bedroom/two bath designs that sleep eight. They rent for $150 a night. This is the most popular cabin style at Georgia state parks, according to Georgia State Parks and Historic Sites Director Becky Kelly. 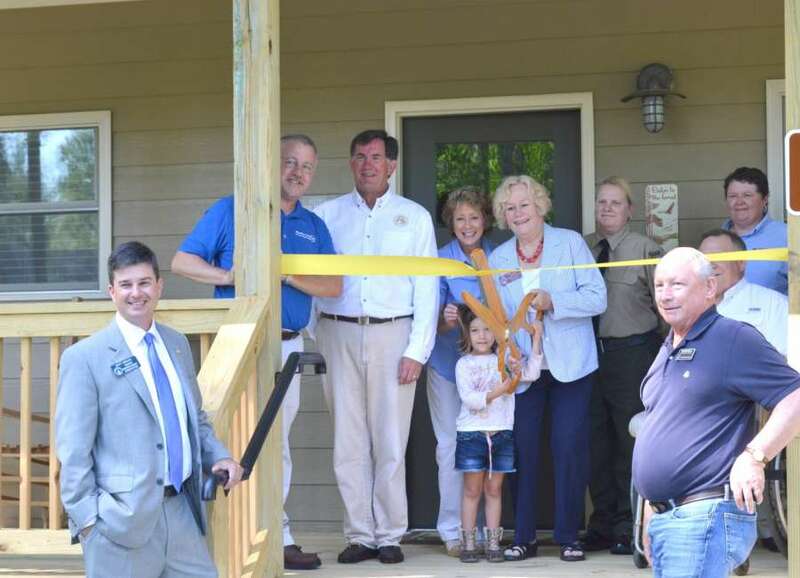 The cabins blend the indoors and outdoors with porches and an outdoor space with a fire pit, grill and picnic table.In addition to state park officials, State Rep. Lynn Smith, R-Newnan, and State Sen. Matt Brass, R-Newnan, spoke at the ribbon cutting event. The state of Georgia bought the park land in 1999 as one of several acquisitions along the Chattahoochee River, but development of the park was a long-range plan. Coweta County 4-H started advocating for a kick-start to the project, and Coweta County got involved by paying for the creation of a “general development plan,” agreeing to help with infrastructure and employee costs. In 2006, Smith and then-Sen. Mitch Seabaugh got $7 million in the state’s bond budget for the first phase of park development. The Friends of Chattahoochee Bend State Park formed and began clean-up projects and, later, trail-building. The “Bend Friends” became the first state park friends organization to be formed for a park that wasn’t open. Adding major amenities to a state park doesn’t happen overnight, according to Brass. The initial cabin construction, as well as the paving and infrastructure for the future cabins, cost $1.6 million. The biggest part of that went to removing rock, as well as installing the water lines, sewer lines and septic tank, and paving, said James Hamilton, assistant director for Georgia State Parks. New cabins will cost between $250,000 and $350,000, depending on size and style. The park has a master plan, but the next steps depend on use and popularity. The goal of the master plan is a comprehensive state park that can sustain itself, Kelly said. “We’ll continue to look at that master plan, understand what the community is supporting, what we need in this system to advance,” Kelly said. “I can’t really say whether we would go for camping next or other types of amenity sets next.